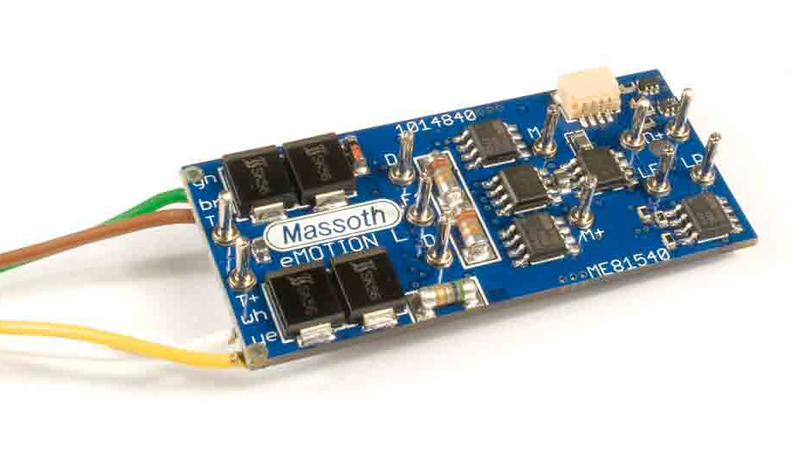 The Massoth eMOTION L decoder is a compact, 2.5 Amps driving and function decoder designed for installation in 1 motor, G-scale locomotives. The L decoder conforms to the pin arrangement of the LGB®'s 55021 decoder making it suitable for installation in LGB® locomotives equipped with a direct-decoder interface. It is also suitable for installation in locomotives equipped with LGB® six pin decoder interface, a Massoth six-pin interface cable 8150602 is required. The L decoder features selectable 14/28/128 speed steps, 2 light and 6 function outputs with a maximum total load capacity of 1Amp, analog and digital operation, digital and analog Back EMF, and a Massoth-SUSI interface. Operating the L decoder with an additional power buffer increases its dependability: brief track power disruptions are bridged in analog and digital operation, and contaminated tracks and switch frogs are negotiated without any speed changes or interruptions. The Massoth eMOTION L decoder is fully compatible with NMRA/DCC, and compatible with all generations of the LGB® MTS system.